Welcome to the web home of Hidden Pines Christmas Tree Farm in Clyde, Ohio! Preparations for the 2019 season are underway! This year we will open the south field where we have some beautiful Canaan Fir. We also will have a large selection of Scotch Pine this year. There will be a limited supply of Colorado Blue Spruce, Douglas Fir, Fraser Fir and Concolor Fir. And back by popular demand the gorgeous pre-cut firs that we bring in from another Ohio farm. Our first big weekend is November 16 and 17 when our gift shop is open and we have our annual tree tagging event. As Thanksgiving is late this year we will have a second weekend of tagging November 23-24. During those weekends, you can come walk the farm and choose your tree for cutting at a later date (cut-your-own begins November 29 and runs through December 22....if trees are still available). Our new method of pricing and tagging worked well last season and we will make a slight change to improve it even more this year! Order your fresh wreaths and grave decorations early as things start to back up as the season progresses. 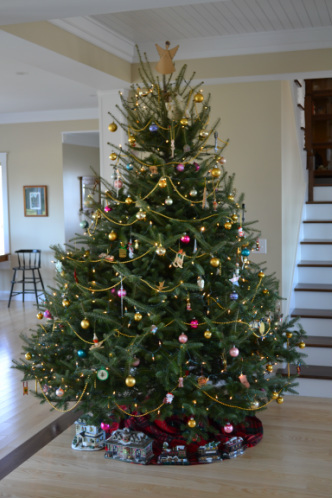 Come make a live Christmas tree a tradition in your family! We grow Fraser and Canaan fir, Douglas fir, Concolor (White) fir, Colorado Blue spruce, Norway spruce, Serbian Spruce, Black Hills Spruce, Scotch, Austrian and White pine. We are also experimenting with a few Korean and Turkish firs....stay tuned. Please make yourself at home and look around our site. We hope to add more to it as time goes by....including a page for customers to submit pictures of their decorated Christmas trees. Be sure to check out our Blog or our Facebook page to keep up to date with the latest activities happening at Hidden Pines! If you would like to stay informed of news about our farm and receive special offers, please submit your email address below.